This badge was inspired by a badge that I saw on a blog called MAKER-WEARER-VIEWER. Laura Potter informed & directed me to this blog a good few months ago. The Blog belongs to Zoe Brand, she is making 365 Brooches. Our projects are inseparable in places and I am very jealous of some of her designs, "Moustache Monocle", A Cork Pin Board named "Not Today" and the brutally simple "$10 Silver". 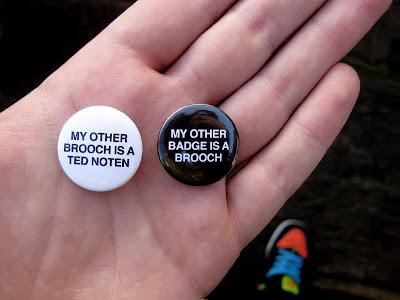 Anyway I had not checked her blog since late July and since she has had a badge made that says "my other brooch is a Ted Noten". Now I had always skirted and/or flirted around broaching (wink-wink) this idea that I was straying from Badges into Brooches and back again, avoiding in the process directly defining either, as I don't know what I am doing. But it has to be said that they are all labeled & tagged badge, so they must be badges. RIght?! But having seen this badge/ brooch I could not avoid confronting this subject head on and turn this monologue into a Dialogue. So firstly I have re-designed I mean re-made her badge as I gather from Zoe's post that she wasn't so happy with the result. Maybe she won't like this either… The other badge is my addition to the dialogue, and an acknowledgement that I have in some cases have made Brooches and will continue to do so. This Post is labeled/tagged for the first time Brooch.